What do you think of the off the shoulder trend? Love, hate, indifferent? I wasn't sold on it, and although I'm still unconvinced I need to run out and buy them in multiples, I think the good outweighs the bad if you want to add one to your closet. 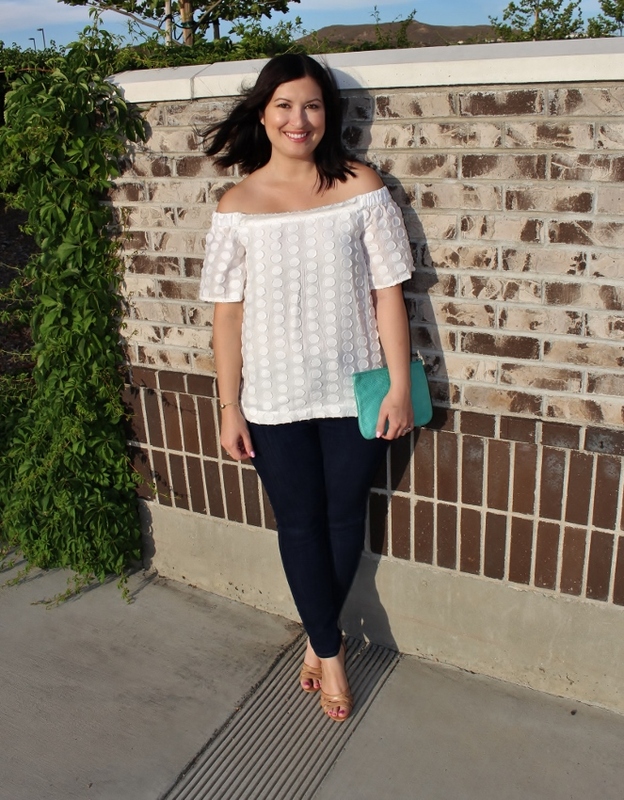 If you like your shoulders as I think most women do, an off the shoulder top can be ultra flattering. I'm pretty modest, but I don't want to look matronly. This allows for a little sliver of skin without feeling showy. I suggest using a drop of liquid highlighter on your arms for extra glow. It looks great with jeans and shorts, perfect for the hot Summer months. This style tends to ride up, and I hate fussy clothing. Maybe this is more of a sizing issue, but I did feel like I had to adjust the way it hung on my body a few times. So clearly I can see why this is such a hot trend. 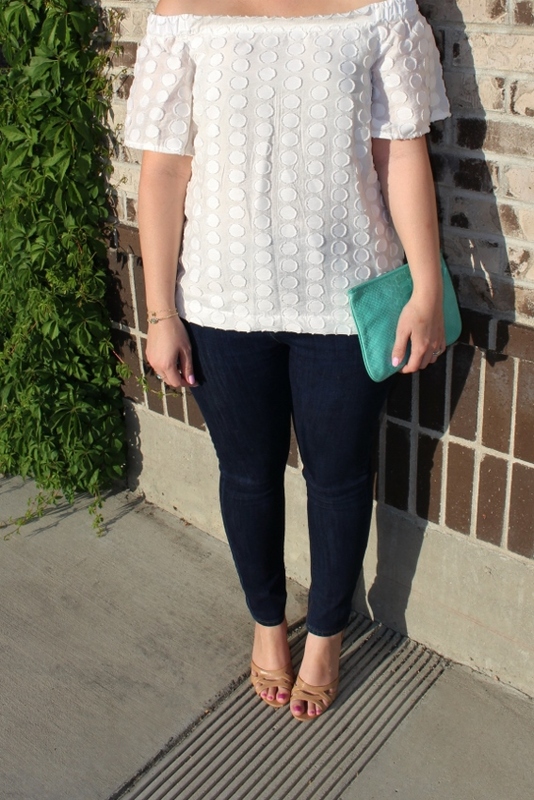 I think it's best to keep the rest of the look simple and let your top half be the focal point. I was tempted to really pile on the accessories but the whole point of this is to look easy breezy so I stopped myself. I can't wait to wear it on vacation with shorts, flat sandals, and a frozen drink in hand. June cannot get here fast enough! You look stunning Noelle!!! Love the simplicity of this look - and agree with your pros and cons. That's why i prefer cold-shoulder tops - they show a sliver of arm/shoulder but also have a strap so no need to keep adjusting. You look gorgeous lady, I would so wear this outfit and actually I did and shot it for the blog lol. I like off the shoulder but I tried not to go crazy, I have one dress and a couple of tops. My fave trend right now, is probably sundresses, not sure that's a trend, but I want alllll the pretty dresses. I do love the look of the off the shoulder tops - this one is gorgeous on you - but my hangups are definitely with the fussiness and of course the necessary evil of the strapless bra. I've only ever had one off the shoulder top in my life, forever immortalized in my junior high school photo. It might be time to give it another go around. It looks cute on you! I do want to try this, I just loathe strapless bras and try to avoid having to wear them...that being said, I still may give it a try! Thank you for the comments ladies! Like many of you, I'm not a huge fan of strapless bras either ( I wear my Victoria's Secret tee shirt bra now 95% of the time) so I understand why this top is cumbersome. It's very casual though, so I think it's worth giving a shot! I love it for summer! I loveeeeeee that top! It's ridiculous though the amount of work I've had to endure trying to keep the shoulders even! Agreed! I should have mentioned that but forgot!